This is probably my favourite picture I've ever taken. Just how small you feel next to something this astonishing. A real "oh my goodness" moment happened to me when I saw this image on the computer. 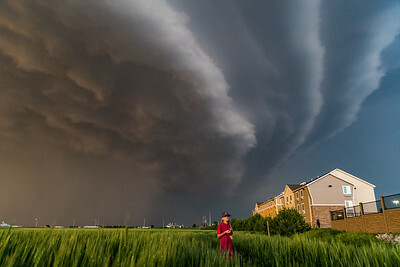 Standing under it was one thing, but reviewing it later made you realize, once the adrenaline wore off, the magnitude of this cell. May 27th, 2018. 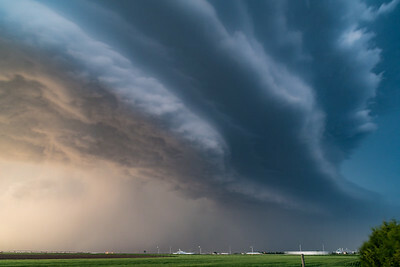 This was a "tail end charlie" supercell that formed at the end of a squall line on June 1st, outside Ord, Nebraska. 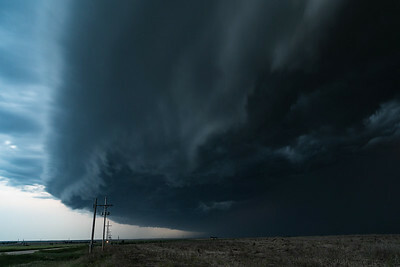 It was fast moving and featured a frightening amount of close range, CG, strikes. 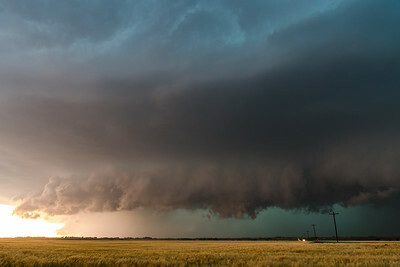 You have a tornado warned supercell that is showing clear western skies, and a very mean hail core to your eastern view. 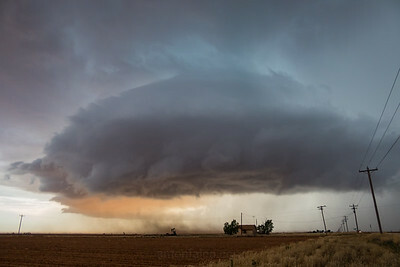 A storm that looked a lot like a UFO trying to take that home over Lamesa, Texas. May 31st, 2016. One of my favourite pictures. 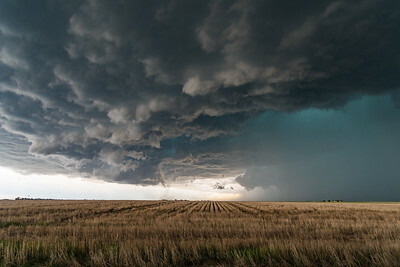 It looks like you're about to be overtaken and absorbed by a monster of a cloud. 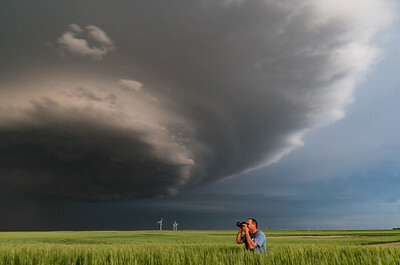 More from the Burlington, Colorado supercell. The farms on the bottom of the screen help to give you a sense of scale. 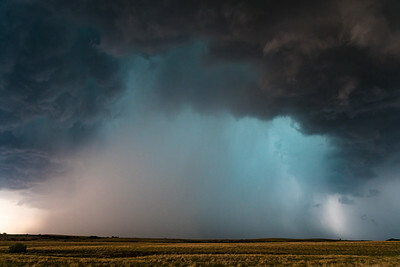 The more turquoise the cloud, the more prominent the hail. 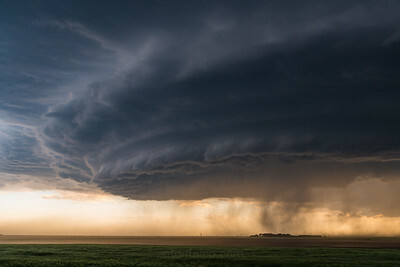 You can take a guess on how large the hail is in the core. Hint: bring a bat. 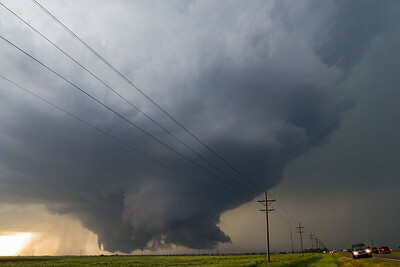 This cell was sitting and rotating in basically the same spot for nearly 40 minutes. 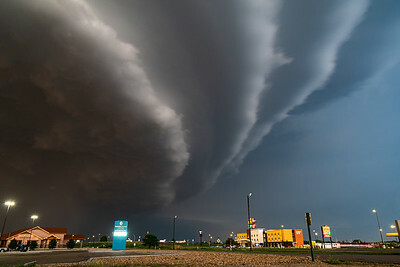 We were sitting behind the hotel getting pictures, and the back of the hotel served as a wind block; blocking the inflow winds from knocking us around. 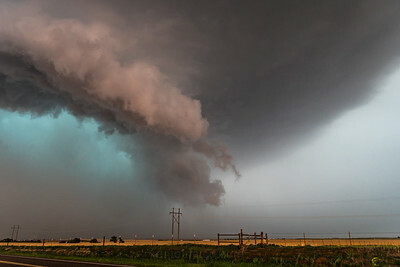 I love the incredible contrast between the dark upper level clouds and they very violent looking hail core (greenage). May 29th, 2018. 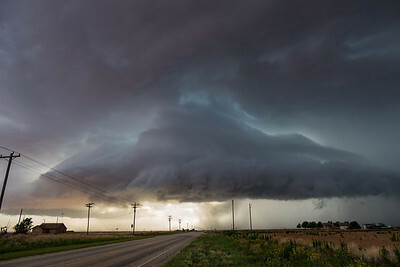 Another look of the aliens invading the small town of Lamesa, Texas. May 31st, 2016. 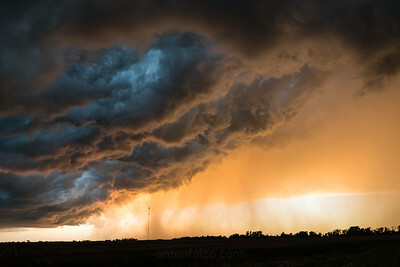 Dying supercells sometimes produce the best sunsets. 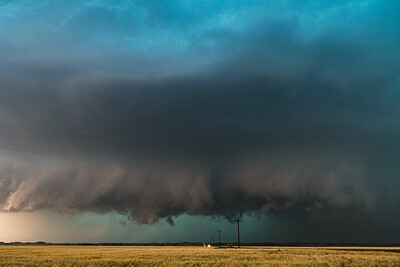 This dying cell, near Elk City, Oklahoma (May 26th, 2018) was no exception. 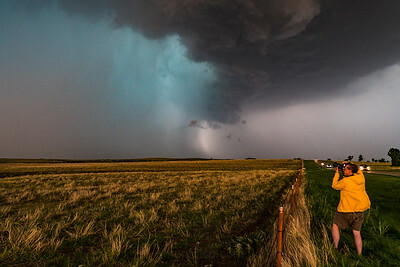 Staring down the nasty hail core of May 29th, 2018 near Buffalo, Oklahoma. Sometimes, the best pictures are behind you. 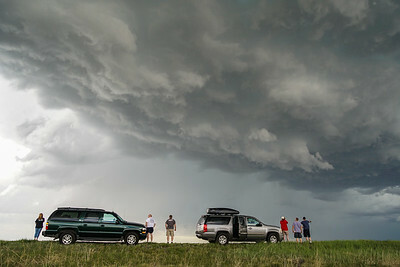 When everyone was staring at the core in front of them, I happened to turn around and see the outflow dominant feature with large hail behind me. 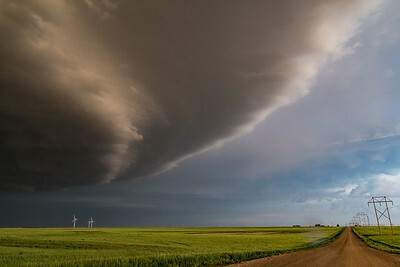 The "greenage" off to the right is baseball sized hail. The striations around the core made for a nice image. May 26th, 2017. 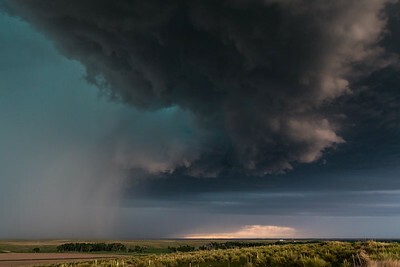 Near Cope, Colorado. This incredible sunset shot (one of my favorites) almost didn't happen. 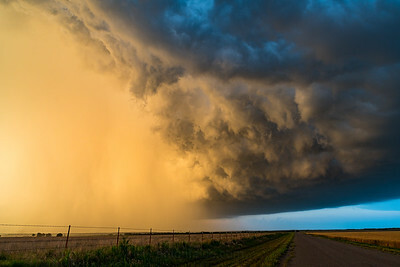 A storm to the west was blocking out the sun entirely, but as fate would have it, less than an hour before sunset, it completely evaporated out of view and allowed the sun to hit the rainfall at just the right angle to produce this image. I'm glad it did. May 25th, 2018. 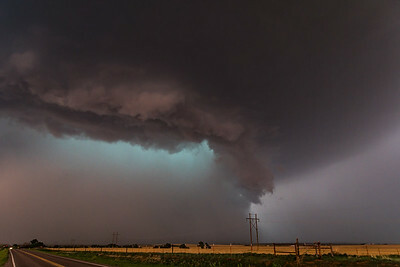 This entire storm was rotating. The bottom part was going to the left, and the top part was going right. 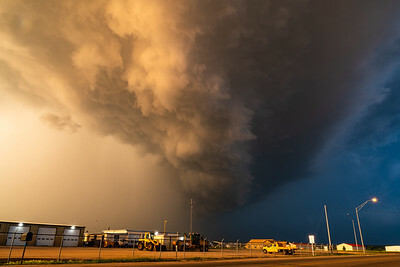 The storm motion was insane. I had to lie down on my back, in prickly plants (that I soon learned), to get both the cars and the clouds in the shot. Staring down baseballs in Oklahoma. 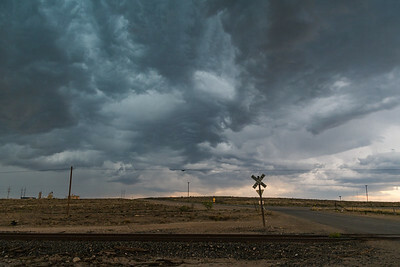 Near Carlsbad, New Mexico, on May 22nd, 2017. 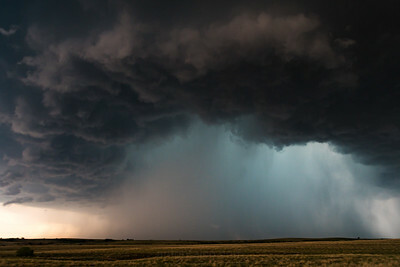 The sky on this cell was alive; constantly rippling. It also flooded the streets on the way back to town.